Media & Entertainment – Page 2 – I say. Essay. Assay. ऐसे. Extraordinary action and thrills — living up to the Spiderman 1 & 2 standards. The villain — actually one of the villains — a special-effects marvel, is of triple parentage. Wait that’s not part of the plot. What I mean is that he has the looks of The Hulk, physical composition of The Mummy and the size of Godzilla! A bit of Abhimaan thrown in. Professional jealousy leading to (pre)marital discord. She resents his popularity. She even resents him publicly kissing the ‘other girl’. She says, “How could you? That was OUR kiss.” That “OUR kiss” of course referring to the famous scene from the first movie where Spiderman hangs upside down while she pulls his mask down to do the needful. So it is not only in India that a public kiss (peck, whatever) between Richard Gere and Shilpa Shetty causes so much unrest! But notice that in America the emphasis is on getting the priorities right. Pull the mask sufficiently — to only expose the lips. Why bother with frivolities like look into the eyes and all that jazz(baat). The American onlookers reaction to anyone who’s perched on some high-up spot (which happens a lot in Spiderman) reminded me of the “arrey bhai yeh suicide kya hota hai?” “jab angrez log martey hain toh usko suicide kehte hain” from Sholay when Dharmendra climbs onto the water tank! A bit of Raj Kapoor’s Sangam — friends in love with the same girl. A bit of Qurbani (and 20,000 other movies) — one of the friends interrupting with his own torso, the trajectory of a projectile (bullet, knife, blades, poles etc.) aimed at the other friend! And as a befitting finale, dying in the lap of his friends after a refusing-to-let-go-off-footage-crunching dying speech! A Ramu kaka benevolent equivalent who knows some khaandaan ka raaz that sorts out some misunderstanding. Ramu kaka, if only you had opened your mouth earlier — Spiderman-2 needn’t have been made! One of the characters loses his memory and then regains it later — both transactions (losing and regaining) contributing to the plot! Vintage Hindi cinema, right? There’s a scene completely lifted from Dilwale Dulhaniya Le Jayenge (DDLJ). Remember the song ‘Ruk ja…‘? Here Shah Rukh is played by Spider Khan, oops, Spiderman. There we had a Simran — Kajol. Here we have a simmerin’ Kirsten Dunst. (Simmerin’, Simran sounds similar, right?) The song and dance begins with the hero unexpectedly displaying his nimble finger work on the piano keys. And the rest of the dance is to annoy/rile the heroine. I won’t be surprised if Farah Khan has actually ghost-choreographed this song! Actually I would be surprised. Else either Farah’s PR, or the Indian media (not much separating the two, right?) would have left no stone unturned in shoving this news down our throats! Remember how they went berserk after her Shakira tryst? Again DDLJ — remember SRK talking to Simran’s mom in a simranizing tone, oops, sermonizing tone? “Meri maa ne mujhe sikhaaya thha. Zindagi mein do raste chun sakte ho. Ek aasaan. Ek mushkil. Blah. Blah” That is the gyaan from this movie too — we are what we choose to be! I left the movie with a heavy sense of DDLJ vu! In the last few months that I was away from here, I read 4 books. Maus by Art Spiegelman, Persepolis by Marjane Satrapi, Maus II by Art Spiegelman, and Persepolis II by Marjane Satrapi. Ok technically that makes it 2 books and their sequels. All these books were lent to me by a colleague who believed I would enjoy reading these. It would be an understatement to say that I enjoyed reading these! I am a changed person. Both Maus and Persepolis are set against the backdrop of political upheavels that changed the lives of their protagonists as well as their societies. In Persepolis the Iranian revolution and the war with Iraq form the backdrop against which Satrapi plays out her autobiographical story. Art Spiegelman didn’t have an interesting enough backdrop perhaps — growing up in America. So Maus is actually an account of his father’s survival during the Jewish holocaust. And believe me this one is as powerful as Schindler’s List. I STRONGLY recommend STRONGLY recommend these 4 books to you. The next book I would recommend to you doesn’t exist yet. Or maybe it does exist, as fragmented jottings, which are waiting for a political, society-altering context! I could introduce the author to you though — Sunandini Basu, (Soo to friends) who blogs snippets from her life at inktales.blogspot.com. These are comics in the Scott McCloud (who has been called the Aristotle of comics) mould. Each one showcases not only the authors’ story-telling ability, with imaginative narratives; but also the authors’ innocent eye for detail; AND a talent to translate that into simple yet powerful visuals. I had seen such a talent in Ry who researches maths but used to maintain a wonderful journal of his life at four.livejournal.com. Then one fine day, he decided he had had enough of sharing his life with the world and deleted all his posts. I guess what he missed was a political, society-altering context! So I hope Soo gets the political, society-altering backdrop for her story soon! Sify: Nothing exclusive about it! 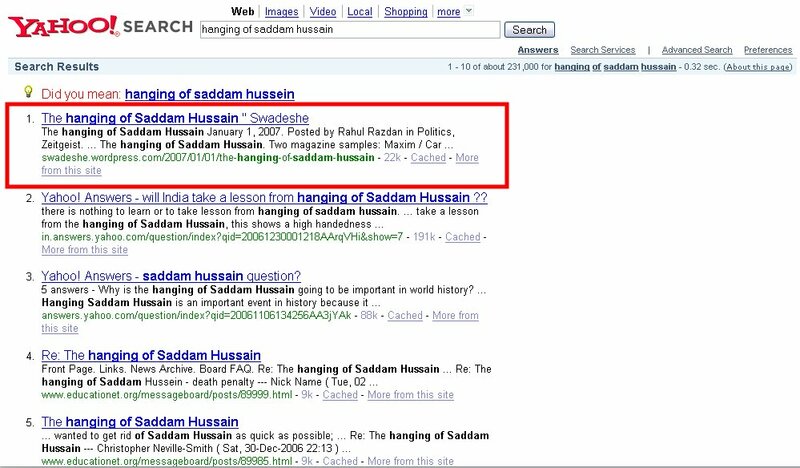 In the last two weeks when The Hanging of Saddam Hussain posts (here & here) were attracting all kinds of search engines, many of which (as I mentioned earlier) I didn’t even know existed, there was one search service which I did identify — Sify Search. However, what astounded me was the ‘Sify Exclusive’ label next to each search result. Obviously there was nothing (Sify) exclusve about these results, since in any case Sify Search is “enhanced by Google”! This is reminiscent of a trend in mainstream media where every news house claimed ‘exclusivity’ even for interviews and stories being simulcast all over, perhaps only with different camera angles!